We recently “broke” two Keurig Coffee Brewers (2 different models) last month at work. Both were in operation for less than a week. On both brewers, no water would pump out. You could hear the pump briefly start, then immediately quit. I searched the web for a clue as to what might be the problem and found nothing. Bed, Bath & Beyond replaced both units. 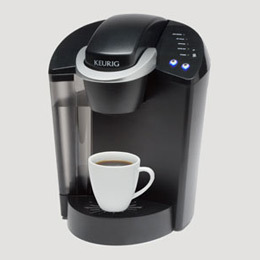 On the second return, the BB&B clerk mentioned that over-pressurized K-Cups might be a problem as we’re located near Colorado Springs, elevation 6500+ ft. All K-Cups we’ve purchased here have extended tops & bottoms and are extremely tight. The clerk said that because the top of the K-Cup gets pierced first, the over-pressurized K-cups may be causing coffee grounds to be forced back into the pump (causing its failure). The solution she suggested is to press the K-Cup into the holder and pierce its bottom BEFORE lowering the lever/handle & subsequently piercing the top of the K-Cup last.